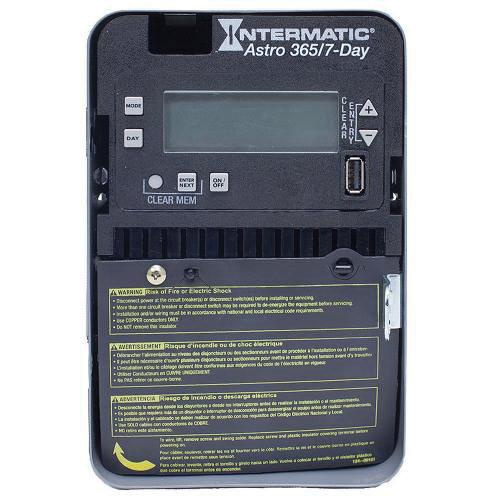 Intermatic ET2800 Series 1-Pole 1-Circuit Astronomic basic plus electronic control is rated at 30-Amps and 120 - 277-Volt AC. It features On/Off action and SPST contact configuration to provide maximum conductivity. It has contact rating of 20-Amps at 28-Volt DC, 30-Amps at 120 - 240-Volt AC resistive, 30-Amps at 120 - 240-Volt AC inductive, 20-Amps at 120 - 277-Volt AC magnetic ballast and 5-Amps at 120 - 277-Volt AC tungsten. This electronic control accommodates wire of size 18 - 10-AWG. It has timing range of 7 days/365 days. This electronic control is suitable for interior lighting, exterior lighting, electric pumps, electric motor control and various other electrical loads. It features Type 1 metal enclosure. It measures 130.2 mm x 87.3 mm x 200 mm. It withstands temperature rating of -40 to 40 deg C. This electronic control is UL/Title A20 listed.